If you’re like me and have a slight infatuation with menswear pieces that mostly consist of the over-sized button down variety, then you face that daily dilemma of keeping the staple fresh. However, with the tie neck trend that was first popularized in the 70’s making a quick comeback this fall, our basic button downs are now getting a much-needed face lift. As we all know from the spring season’s charming parade of button front skirts, flared denim, and the various lace-up blouses, lace-up sandals and lace-up heels (Did I mention lace-ups were big this spring? ), the 70’s are back on the fashion front, and in a really big way. And, one of the 70’s-inspired trends that has quickly emerged for all those who dare to embrace their inner Annie Hall, is the tie neck blouse. Being labeled as the must-have item for fall, this style staple’s versatility has been documented since its quick rise to popularity in the 70’s and 80’s when women first started to enter the business world, and had no previous example of how a female should dress for the corporate setting. Taking cues from their male coworkers, while also trying to still embrace some femininity, women decided to add small feminine details to their mostly menswear-based ensembles, and that is how this trend, also labeled the female tie, was first conceived. However, instead of the power suits and pencil skirts of the past- although I still love the idea of pairing this item with a great pair of tailored trousers- the tie neck blouse has been completely revamped. This season, fashion houses like Gucci and Claire Waight Keller at Chloe (I’m kind of enamored with these undone versions of the tie) are taking a more casual approach and pairing these tie neck blouses with denim skirts, flared jeans and casual trousers. However, this piece isn’t just for female fashion enthusiasts looking to revamp their wardrobe for fall. Labels like Gucci have completely flipped the switch and incorporated this feminine staple into their men’s fall collections, making the powerful statement that men can also humbly play with gender fluidity when it comes to getting dressed. Also, one of the best things about this trend is that you can simply purchase the tie accessory and update those favorite pieces from your existing closet- wear this piece undone for an almost completely different look as well. Or, if you aren’t afraid of the commitment, purchasing a statement piece with the bow detail already built into it is the way to go. I found quite a few tie neck blouse options from ASOS, along with a discount code from Codesium, and the perfect Kimchi Blue printed piece also. So, whether you choose a printed blouse, go for a simple black and white option, or only want to indulge in the accessory itself, this trend is sure to be the perfect update to your fall wardrobe. Divine… amazing blouse, I love stripes… and those heels are to die for… always so stylish! 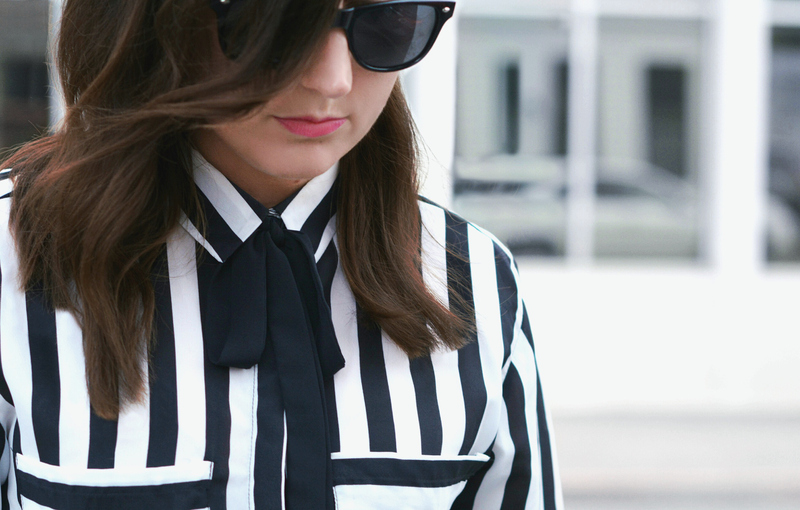 YOU LOOK SO EFFORTLESS IN THE STRIPES! SO CLASSY! xO! I adore this look! wonderful!